President-elect Donald Trump waved as he left after speaking at a news conference on Wednesday. 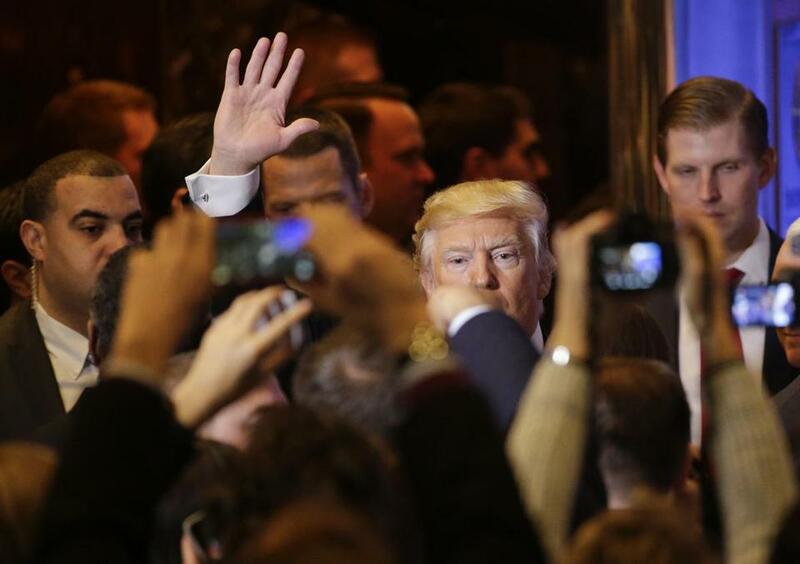 President-elect Trump finally held a news conference, but as is typical, he often made claims that have been repeatedly debunked or discredited. Here’s a guide to 15 of his more notable statements, in the order in which he made them. Trump is exaggerating. During the primaries, he was a near-constant presence on television because he frequently called into interview shows. But he generally only held news conferences after primary contests were held. He last held a news conference on July 27. With regards to Ford, analysts say Ford’s decision to expand in Michigan rather than in Mexico has more to do with the company’s long-term goal - particularly, its plans to invest in electric vehicles - than the administration. It’s easier for companies to find highly skilled workers to build new products, such as electric cars, in the United States than in Mexico. Actually, the Chinese hack of 22 million accounts at the Office of Personnel Management was front page news. The Russian hacking of the presidential election and the OPM hack are not directly comparable. The Russian campaign, as described by U.S. intelligence, involved more than just hacking, with the aim of disrupting and possibly influencing the political process. The Chinese hack had a more isolated goal - espionage. China appears to have wanted the material in order to engage in possible blackmail. Obama administration officials say the China case is different because it was purely a case of spying - something the United States does as well. U.S. officials also say that China responded to U.S. pressure after the hack was discovered, and there are signs its espionage activities have been reduced. China may have been receptive to U.S. pressure at the time because President Xi Jinping was about to visit the United States, and he did not want the hack to mar the visit. But Trump’s remarks also ignore the broader implications of the unclassified intelligence report released on Jan. 5 - how the Russian government used Internet trolls and RT (Russia’s state-owned international news channel) to amplify negative reports on Clinton and U.S. democracy. Trump overstates the disclosure about Clinton getting a debate question. During the Democratic primaries, a debate was held in Flint, Mich. to focus on the water crisis. Donna Brazile, then an analyst with CNN, sent an email to the Clinton campaign saying that a woman with a rash from lead poisoning was going to ask what Clinton as president could do the help the people of Flint. There’s no indication Clinton was told this information but in any case it’s a pretty obvious question for a debate being held in Flint. In her answer, Clinton committed to remove lead from water systems across the country within five years. Lee-Anne Waters, who asked the question, later said Clinton’s answer ‘‘made me vomit in my mouth’’ because that was too long to wait in Flint. The Islamic State terror group arose in response to the U.S. invasion of Iraq in 2003, but it began to fade after the Bush administration surge in 2008. The civil war in Syria breathed new life into what had become a moribund organization. The conflict in Syria created a perfect vacuum in terms of governance, and so the civil war became an opportunity for the restoration of the organization. ISIS then saw opportunity to rebound in Iraq. One factor was the withdrawal of U.S. troops order by President Obama. But there was also rampant mismanagement by the government of Prime Minister Nouri al-Maliki, which greatly degraded the Iraqi military and exacerbated tensions between Sunnis and Shiites. Trump is being misleading when he says he has stayed away from Russia. Trump repeatedly sought deals in Russia. In 1987, he went to Moscow to find a site for luxury hotel; no deal emerged. In 1996, he sought to build a condominium complex in Russia; that also did not succeed. In 2005, Trump signed a one-year deal with a New York development company to explore a Trump Tower in Moscow, but the effort fizzled. This is basically correct. The law doesn’t say the president can’t have a conflict of interest. But Congress, under Title 18 Section 208 of the U.S. code, did exempt the president and vice president from conflict-of-interest laws on the theory that the presidency has so much power that any possible executive action might pose a potential conflict. Trump is wrong on both counts. A Pew Research Center poll conducted Jan. 4-9 found that 60 percent of Americans believed Trump has a responsibility to release his tax returns. Trump claims he has given $102 million to charity in the past five years, but a Washington Post investigation found not a cent in actual cash - mostly just free rounds of golf, given away by his courses for charity auctions and raffles. Trump’s tax return would clear up exactly how much he has really given to charity - indeed, whether he has given anything at all. Trump’s comment that there ‘‘billions of dollars of losses’’ in trade reflects a fundamental misunderstanding. Americans want to buy these products from overseas, either because of quality or price. If Trump sparked a trade war and tariffs were increased on Chinese or Mexican goods, then it would raise the cost of those products to Americans. Perhaps that would reduce the purchases of those goods, and thus reduce the trade deficit, but that would not mean the United States would ‘‘gain’’ money that had been lost. Trump exaggerates here, and appears to misunderstand a fundamental part of the Affordable Care Act. State-by-state weighted average increases range from just 1.3 percent in Rhode Island to as high as 71 percent in Oklahoma. But the most common plans in the marketplace will see an average increase of 9 percent, according to the Kaiser Family Foundation. These plans have been used as the benchmark to calculate government subsidies. We cannot resist noting that Trump was the leading purveyor of false ‘‘birther’’ claims questions, based on no evidence, that President Obama was not born in the United States. He frequently claimed that Obama had spent $2 million to cover this up - a number he plucked out of World Net Daily, which promotes conservative-leaning conspiracy theories.